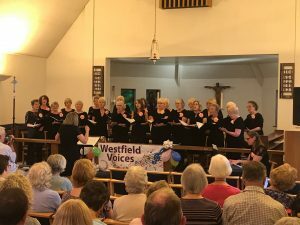 Westfield Voices weren't always known by that name, in fact they won a grant at our Dragons' Den 6 to help them to re-brand (including new equipment) from Westfield Ladies Choir - a name that has been well known in the community for decades, but was beginning to restrict what they wanted to do going forward. They have recently been in touch with a report on how they've got on... The Dragons' Den pitch - Westfield Ladies Choir Relaunch as “Westfield Voices” - Modernise and rebrand Westfield Ladies Choir in order to allow us to reach out to a wider age range and involve more local residents and continue to support local groups, events, schools and charities: The project really took off at our relaunch concert on 28th July. Since then we have been able to use our new equipment in a number of venues which would otherwise have been difficult for us to attend. We absolutely loved our visit to Fosseway School. We were also delighted to perform at Trinity Primary School for the first time.